I am working on an Azure Stack project and sincerely would like to leverage Veeam as the backup solution. Is it possible at this moment? Currently the only way to back up VMs running on AzureStack is to do that from inside the guest. So, feel free to protect those workloads, using our Veeam Agent solutions. Also, it might be worth waiting till Update 3 release, because it has agent central management functionality included, which should ease the orchestration task dramatically. At the moment there is no Direct Restore to Azure Stack support in Backup & Replication. I've been working with some providers who have gotten creative and worked out a way to manually restore VMs from Agent backups back into Azure Stack. They have done this with PowerShell where they import the VHD and then construct and new Azure VM using the New-AzureRmVM commandlet. Thanks for the information. 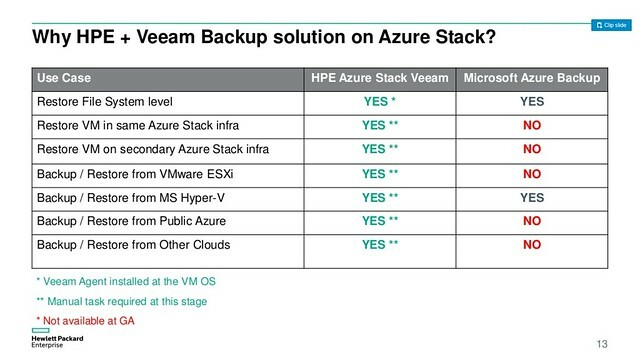 We found this Azure Stack and Veeam presentation from HPE which hinted support but with double asterisk which I assume is because of the manual restore method you have mentioned. Hopefully there will be announcement regarding support soon. Gostev wrote: Notably, one of the lesser known features of our upcoming Update 4 is direct restore of any backup to Microsoft Azure Stack.